I love this. I spent quite a while working with my (more online savvy and successful) brother on some of his website related projects. I laugh at this comic because it is so true of our internet work ethic. 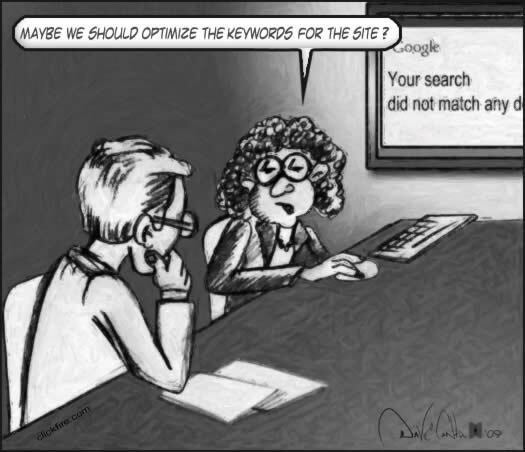 Everything these days is about search engine optimization. The only part about this that bothers me is often you will stumble on websites that are just loaded with SEO and no real content. I’ve been to quite a few sites recently where every article was literally just rehashed from other articles, slightly changed around and the SEO terms were really just copy-and-pasted. They placed well in search results as well! It’s kind of ridiculous. The phrase actually came up during a meeting where we were discussing optimizing a site for its keywords. The performance was so bad that someone suggested doing the reverse. Hence, get a new keyword list based on words for which the site already performs.